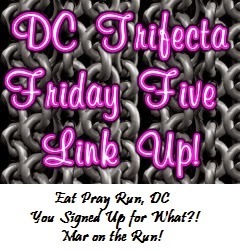 Today I am linking up with the lovely ladies of DC: Courtney at Eat Pray Run DC, Cynthia at You Signed up for What?, and Mar at Mar on the Run, as I do every Friday. 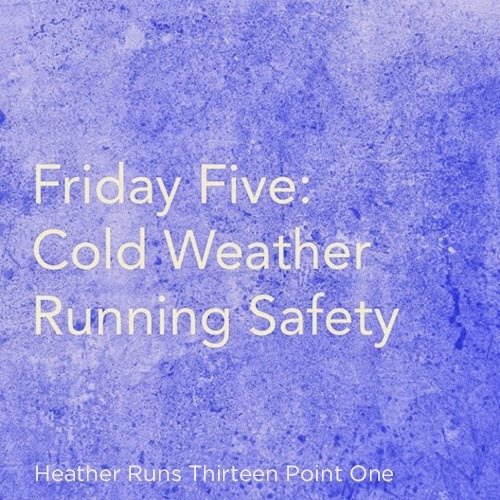 This week's theme is "Cold Weather Running Safety", which is another great topic. They've got some great ones for the month of November (as always, but they were nice enough to get together and plan out the whole month at once, for our benefit – thanks ladies!). 1. Wear bright/reflective clothing and bring some lights with you if it's dark. I'm sure you've heard this a million times, but I can't emphasize it enough. I've seen way too many runners out there in the dawn/sundown/night wearing all black – what are they thinking? It can be so hard to see runners/walkers/cyclists at any time of day, but I think in the grey of winter it can be even more difficult. I'm always aware of them because I am one, but I've seen way too many near incidents because drivers can't see the runners. I also love to use Road ID flashing lights as well as Knuckle Lights for when it's hard to see the sidewalk at night. 2. Be aware of your surroundings. Again, a tip for all year round, but it's a good one. Be in the mindset that cars don't see you (most don't!). Watch out for ice patches. Keep your headphones low so you can still hear outside noises. 3. Wear a gaiter. It can be hard to breath the cold air in. Wear a gaiter to help make it more bearable. I got one last winter and it really made a world of difference. 5. Wear a Road ID. Safety should be a top priority, which is why I always wear my Road ID when I'm out running. It gives me piece of mind knowing that if I can't speak for myself, my Road ID gives the information needed for the medics to get to work and so they can call my family. I also like that you can buy different color bands, so if you like to color coordinate, or just like to mix it up once in a while, it's easy to do. Click here if you need to purchase one. They could also make a great Christmas gift! Do you have any winter safety tips? Great list. Love the safety tips. So important to remember ALL of them. I've never run with a gaiter...I think I need to look into buying one! I just ordered a Road ID so I'm looking forward to using it! Glad you got yourself a Road ID - great safety tool. I found the gaiter to be very helpful for winter running. I have a Buff than can be worn many different ways on the head and neck areas (and changed up as you get too warm). I don't have a gaiter, something to look into for this winter. Definitely. I found it to make winter running much more bearable. I have a cinchable neck wamer that is long enough that it can be pulled over my mouth and nose. I don't run with it on but do wear it for my warm-up and cool-down walks, and I love it. That sounds like a great piece of attire.